The Merchants Bank of Canada opened in Montreal in 1868. When the bank closed in 1923 it had 400 branch offices, with some as far away as London and New York. The bank ultimately had to close due to poor credit decisions and losses on major accounts. Despite the failure of the bank, it did manage to issue lots of beautiful and highly collectible bank notes. Our guide below has more information. The Merchants Bank of Canada issued one, two, and five dollar bills dated as Mar. 2nd 1868. There are different varieties based on whether or not the bill has a blue overprint that says Toronto, Perth, or no overprint at all. Some of these notes are scarce. Please contact us for details. Some four dollar bills dated as May 2nd 1870 were printed by the British American Bank Note Co. Montreal & Ottawa for The Merchants Bank of Canada. Prices start at about $500. Ten dollar bills from 1st August 1871 are very rare. Each note has the signature and portrait of Hugh Allan. We don’t have a picture of one currently available. The Merchants Bank of Canada issued four, five, and ten dollar bills in 1873. The $4 bills are dated as 2nd June 1873. The $20 bills are dated as 1st Aug. 1873. The $5 bills could have either date. Some five dollar bills also have a red “F” overprint. Four dollar notes are occasionally available. The other higher denominations are scarce. Five, ten, fifty, and one hundred dollar bills were issued by The Merchants Bank of Canada dated as 2nd July 1886. The two lower denominations are scarce, but still available. The two higher denominations are prohibitively rare. Andrew Allen signed and is pictured on each bank note. The American Bank Note Co. Ottawa printed five and ten dollar bills for the Merchants Bank of Canada dated as 1st January 1900. There are four different varieties based on whether Andrew Allan or H. Montagu Allan signed the note. January 2nd 1903 bank notes are very rare. They were only issued for the $50 and $100 denominations. We are including a specimen below. An issued bank note would have a serial number higher than 0. We are starting to get into some more common bank notes. Feb 1st 1906 $5 bills are worth at least $200, and most are worth a good bit more than that. The front of each note has an engraved portrait of H. Montagu Allan and the back shows a beaver. Ten dollar bills from February 1st 1906 are valued similarly to the above $5 bills. They are common in low grades but scarce in XF condition or better. These were printed by The British American Bank Note Co. Ottawa. It is thought that around fifteen June 1st 1907 bank notes are known to exist from The Merchants Bank of Canada. That may seem like a tiny number, but it is enough supply to meet the demand. These are popular because of the bull’s head on the front of each note. Contact us for pricing details. There are two types of June 1st 1907 $50 bills. Both varieties are valued the same. Even low grade fifties should be worth more than $1,000. High grade examples rare and worth at least a few thousand dollars. The Merchants Bank of Canada issued very few 1907 $100 bills. They are very scarce today. Each note has an engraving of a steamship and H. Montagu Allan. Allan and another person signed each bank note. These notes have an engraved date of Feb. 1st 1916. They were printed by The British American Bank Note Co. Ottawa for The Merchants Bank of Canada. The value of each note is based on its condition. Contact us for details. Edward F. Hebden and H. Montagu Allan are pictured on the front of each February 1st 1916 ten dollar bill. Allan also signed each bank note. These are relatively common in circulated condition. Notes in VF or better should be worth more than $1,000. Each 3rd January 1917 $5 bill issued by The Merchants Bank of Canada has a portrait of H. Montagu Allan and E.F. Hebden. There are two different varieties based on whether or not D.C. Macarow signed the note. Notes with the Macarow signature are the more common variety when it comes to $5 bills. 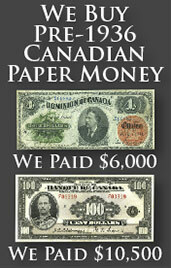 The American Bank Note Co. Ottawa printed ten dollar bills for The Merchants Bank of Canada. These are also dated as 3rd January 1917. The Macarow signature is slightly rarer for this denominations. All 1917 bank notes of the twenty dollar denomination and higher are very rare. Please contact us for exact values. 1917 $50 bills issued by The Merchants Bank of Canada have beautiful vignettes of a stag and a young woman. These bank notes are rare though. Even low grade examples are worth thousands of dollars. There are two different types of 3rd January 1917 $100 bills. The Macarow signature is the more common type; it is still quite rare though. Please contact us for pricing details. We would welcome the chance to purchase a high denomination note. Five dollar bills from 1st Nov. 1919 are some of the most available bank notes from The Merchants Bank of Canada, but they are also very popular. Each note has a large portrait of the Prince of Wales. Prices for these start at about $500 and go up from there based on condition. November 1919 ten dollar bills are about twice as rare as 1917 $5 bills, but the ten dollar notes sell for similar prices. They just aren’t as popular. Each note has a simple layout with a portrait of Sir Hugh Allan in the middle of each bank note. We buy all types of Canadian currency. We are especially interested in bank notes from The Merchants Bank of Canada in Montreal. You might be surprised at how much money we can offer for some currency. And we say that a lot, but it is definitely true with this bank. Send us an email with pictures of the front and back of your bank note and we will respond quickly with our offer. 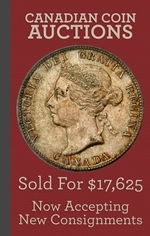 Your piece of currency from The Merchants Bank of Canada in Montreal could look similar to the one seen below. However, based on the fact that so many designs and denominations were used, you probably have something different. Contact us for more value information.